A recent article on the New Scientist Environment Blog entitled ‘Packaging Waste: Facts and Figures’ caught my eye. 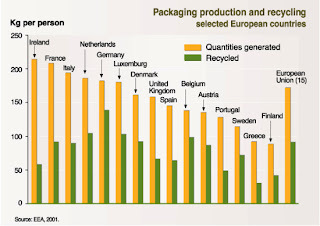 Finland and Greece produce the lowest amount of packaging waste with Sweden, Austria, Belgium and Portugal close behind. Unfortunately Ireland along with France produces the most packaging waste in the EU. Ireland’s level of recycling is also pretty poor compared to other EU countries given the amount of packaging waste that we produce. Germany has the best level of recycling which doesn’t surprise me. I spent a couple of summers in Germany so I’ve experienced their recycling efficiency first hand. I am a little surprised that our level of recycling is so low. I thought that Ireland was doing a pretty good job of recycling now, especially compared to about 10 years ago. I guess Ireland’s motto from now on should be ‘Package less, Recycle more’!